Oh……. the fridge. That cold dark place that is so often overlooked and forgotten. The biggest problem I see? Deep shelves which are near impossible to get to the back of (do you know what is living at the back of yours?) and lack of organisation and/or no organisation. The fridge can be just as organised as other areas of your home, if not more. 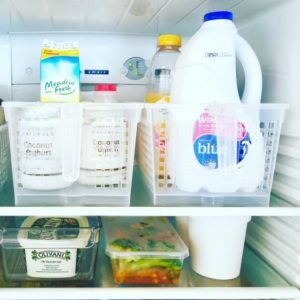 Today I want to share with you my strategies and tips on how you can declutter and organise your fridge AND stay on top of it! Food items in our fridges tend to hide in there for long periods of time and often get lost and forgotten. The fridge is a magnet for clutter and I bet there are things in there that you will never use and don’t need anymore. Grab some rubbish bags, cleaning items and a box for recycling. 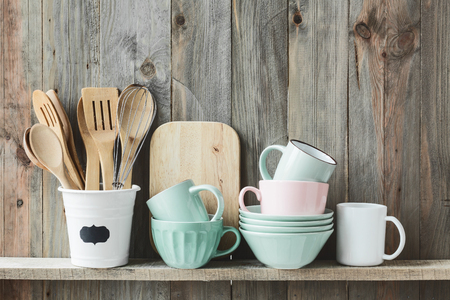 Clear your kitchen surfaces so that you have room to sort. Start in your fridge and work from the top shelf to the bottom, pulling everything out, shelf by shelf. Group like items together. Do the same with the shelves on the doors and the vegetable and fruit crispers. Check expiry dates on items where possible and get rid of anything that is out of date, looks like it has seen better days and items you know you wont use and don’t like. Recycle jars and compost what you can. Now you have sorted your items, use this opportunity to give your fridge a good wipe down. When reorganising your items back into your fridge create zones for them wherever you can and group your like items together. Suggested zones are: Dairy, meats, dressings and sauces, spreads, breads, drinks, fruits and vegetables. Adjust the shelves accordingly to suit. Have a go and let me know how you get on! The kitchen is the hub of every home and is often the busiest area in most households. The pantry is SO often neglected – items build up and create disorganisation and chaos. It is frustrating trying to find what you need which happens when it is disorganised and filled to the brim. Here on Stuff I am sharing how you can have an organised pantry using these three simple steps! Back to school — my top 5 tips! Create new habits and make 2019 your best year yet! 5 steps to organise ANY space in your home! Get organising and decluttering ideas, inspiration and special offers.